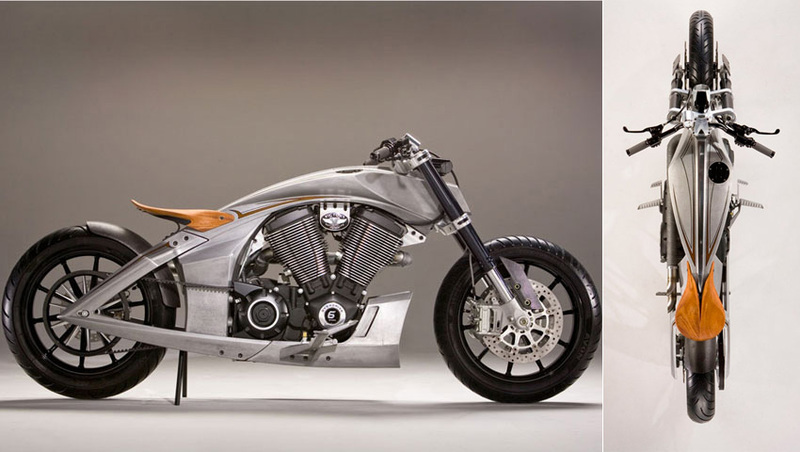 The CORE is a concept motorcycle designed and built by the Victory Motorcycles Industrial Design team to show what a performance cruiser of the future could look like. We like it because it consists of only the essentials: engine, frame, wheels and front suspension – no rear suspension. Oh and a mahogony wood seat (which is a nice balance to the aluminium frame). Built around a Victory Freedom(r) 106/6 Stage 2 power plant (1731cc), producing 97 horsepower / 113 ft/lb, the CORE is a modern take on an American motorcycle. We like where they’re going with this concept (and its probably best on a highway). Less is more. Lets hope they start producing this unique cruiser.